Where do you shop when you’re looking for something either unique, antique, or even exotic? The company was founded in 1995 as an online auction marketplace that connects buyers and sellers. The original name of eBay was AuctionWeb, but the founder wanted to change it in 1997. He wanted something that sounded edgier and so eBay became the name of the company from 1997 forward. Since its name change, eBay grew in size and acquired many other companies. Its headquarters are in San Jose, California, employing over twelve thousand employees and turns out a revenue of eight billion dollars. Disclosure: This post contains affiliate links which means I will be compensated if you make a purchase after clicking them. In my previous post, I looked at a number of Print on Demand (POD) companies that can be used for selling artwork on t-shirts and gifts. In that post, I briefly mentioned Redbubble but up until now, I’ve not had any direct experience with Redbubble. However, I am currently setting up an account so that I can help a photographer showcase his work on the Redbubble site, and of course, then be in a position to sell his work. He has the creative tools he needs, a professional camera and Photoshop, but he now needs a vehicle that will allow him to promote his work. And Redbubble is that vehicle. Now, of course, Redbubble is for artists, designers, slogan writers as well as for photographers. And the good news is that it is free to join. … where you can exhibit and sell your art to the world – for FREE! Making that first sale can be one of the most exciting moments for an artist. Someone has been so impressed by the artwork that they have decided to take out their wallet and make a purchase. What a stamp of approval! Where Can I Sell My Art? If you haven’t already started selling your artwork, then a Print on Demand Company (POD) could be just what you are looking for, to experience that type of excitement. POD companies can be some of the best places to sell art online, not to mention general graphic designs and slogans. 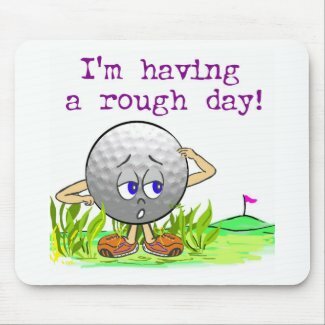 This golf ball character design that I have created, for example, sells on mouse pads (as shown here), on t-shirts, coffee mugs and a whole range of other gift items. All of this is courtesy of a POD company that handles printing and shipping for me. In this case the POD company is Zazzle. If you have a blog or a website but are not sure how to best monetise it then you too could start selling t-shirts or gift items featuring your own designs and slogans. This is a great way to add interest to a niche site. A lot of people want to have an online presence but are unsure as to which type of website would suit them best. It is very easy to be overwhelmed by all the information that is out there so this post is intended to simplify some of the choices for you. I have written about some of the fundamental choices in another post on Website Inspiration. That post outlines 4 different types of websites and then discusses the various tools that you can use to create your website.